In full bloom right now are the beautiful Dogwood trees (Deitsch: es Hundsholz or die Kornelkasch; tax: Cornus spp.). The most commonly encountered dogwood species in the Deitscherei is Cornus florida. 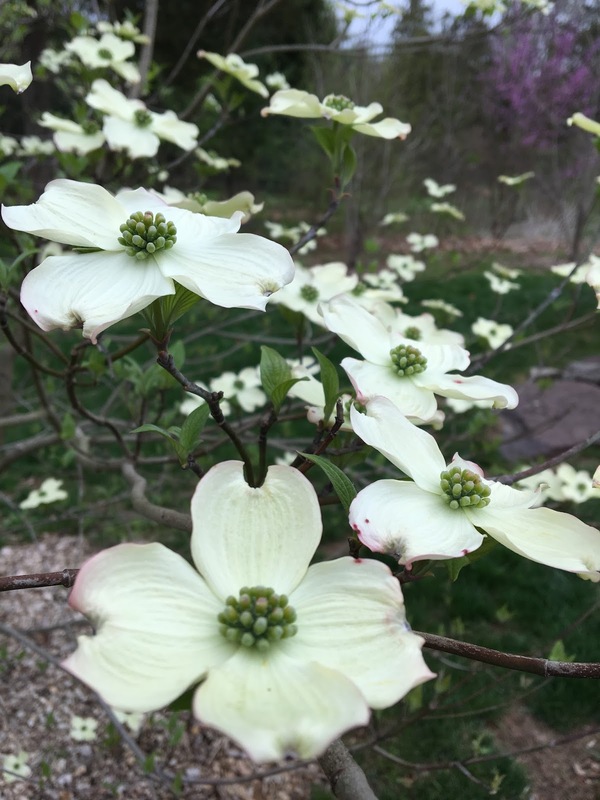 Most people think that the four large yellowish bracts (Deitsch: Draagbledder) are the flowers, but the true Dogwood flowers (Deitsch: Hundsblumme) are the small yellow-green clusters in the center of the bracts. Dogwood is one of the Nine Sacred Herbs of Braucherei. It is one of the Three of Wood, though its medicinal and spiritual uses are not limited to the woody parts of the tree. "No distinction was made between typhoid and typhus. Two forms of this type of fever were, however, recognized: typhoid of the head and typhoid of the body. The former was sometimes referred to as Haernfiewer, which is to be distinguished from cerebral meningitis and mastoiditis which are haernentzinding" (Haernentzinding is "brain fever"). Beesfiewer, apparently, is quite definitely restricted to typhoid types. Naervefiewer... means neurosis, nervous fever. The term, however, was more generally used for typhoid fever. Other terms that cover typhus or typhoid are Hitzichgrankheet ("hot sickness") and Schleichfiewer ("sneaking fever" or walking typhoid). Each of these fevers is believed, even today, to have a "breaking day," and they are days with uneven numbers, particularly three, five, seven, and nine. "Among the English it is customary in case of fever to receive from the doctor powdered china, or, in English, Jesuits' bark, and it proves beneficial in many cases. 'This powder they, likewise, recommend to their German neighbors and its benefits many, but it is very expensive because it is brought from China. In Pennsylvania, it can be gotten gratis for it is the bark of the root of the tree called ironwood or dogwood, the English name Dackwood. It is good for use the whole year through, but in spring with the sap ascends it is most easily peeled off and is most powerful.'" Disclaimer: This information is for educational and discussion purposes only. Nothing in these posts is intended to constitute, or should be considered, medical advice or to serve as a substitute for the advice of a physician or other qualified health care provider. Feverfew may thin the blood, so people on blood thinners should be careful with its use. Also, as the herb is used in inducing menstruation, pregnant women should avoid using this herb. As always, your health is your responsibility. Consult with a doctor before using any herbal remedy or preventative. Decoctions of the bark (Hundsrinn) are said to aid with hemorrhoids. Tinctures of leaf or bark applied to the skin can reduce eczema and other skin conditions. Decoctions of Dogwood leaves are said to kill ringworm, and the fruit added into teas can aid with diarrhea. Poultice of the bark can aid with external ulcers or sores. Hundsbeere (dogberries) also have some antimicrobial, and liver-protecting properties, and the herb can be used as a natural emetic. Spiritually speaking, shavings or cuttings of the bark may be worn in any form or carried as amulets, and the bark, bracts, or the flowers may be burned to break hexes. Note: There is a Verbot or taboo on the cutting of Dogwood for decorative purposes. The sacredness of this plant requires that it be available to those in need in as much quantity as is needed. Dogwood may be cut as offerings to deity but not to ancestor or land spirit; it is better to leave the tree intact in the latter cases. Brendle, Thomas R. and Claude W. Unger. Folk Medicine of the Pennsylvania Germans. Proceedings of the Pennsylvania German Society 45. Norristown, PA, 1935.